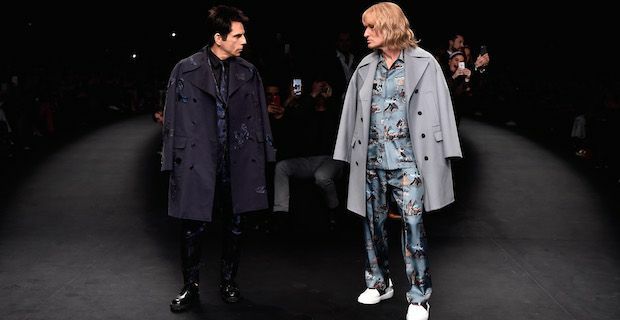 The full power of Blue Steel was unleashed on a catwalk in Paris yesterday as Ben Stiller and Owen Wilson strutted their stuff to help announce Zoolander 2. The publicity stunt took place as part of Paris Fashion Week and will be music to Zoolander fans' ears. The pair walked their walk to the Human League classic Don't You Want Me Baby as the closing act for the Maison Valentino fashion show. After the actors did their turn on stage in character as Derek Zoolander and Hansel, Stiller tweeted the message "Apparently Derek and Hansel have come to terms on #Zoolander 2." The film will not take very long to go to print either with Vogue magazine hinting that filming is due to commence later this month in Italy. Paramount Pictures also tweeted that the movie will hit screens next year saying "So hot right now: Derek & Hansel blaze down the @MaisonValentino runway, #Zoolander2 announced. Coming Feb. 12, 2016." The male model rivals first captured our imaginations when Zoolander was released way back in 2001. Will Ferrell's services as fashion designer Mugatu have reportedly been secured for a return along with rumours of Penelope Cruz joining the cast for this eagerly anticipated sequel.